PokerEduManager, which launched on April 14th, is a new concept for serious online poker players and assists with poker instruction. The program is registered in the Netherlands and was created by Tom Huges, a 31-year-old law graduate, and Lieve de Lint, a 27-year-old neuropsychology graduate. It is the world's first educational management software suite and gives poker players direct methods and strategies for habit retention. This program has been in development since early 2010. The PokerEduManager team, when creating this product, found seven common traits that separate top achievers from the rest of the field: goal-setting, disciplined planning, knowledge of strengths and weaknesses, motivation to study new material, repeating studied content, discussing content with like-minded people, and organizational skills. PokerEduManager was built around each of those pillars. With PokerEduManager, you can use the Personal Knowledge Base, which allows users to store all information and notes in a central place in order to stay organized. There are also Calendar and Set Goals pages that are self-explanatory and very easy to comprehend, along with the ability to discuss hands with friends. 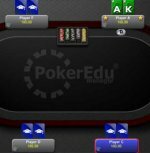 PokerEduManager gives online poker players active learning strategies, which allow for a much greater retention rate when compared to passive methods. PEM engages you in the learning and instructive processes, which have been proven to be successful. Another handy feature of PEM is the ability to view Quick Start Videos, which give customers easy-to-understand tutorials on how to use the various tabs and features in an educational manner. When visiting PokerEduManager.com, you will be able to register for free. PEM customers will have access to the forums, where any questions or suggestions can be posted in order to improve on learning methods. Forum categories include PEM Exchange, PEM Software Suite, Poker Training, and Off Topic. The PEM package comes with a free, 14-day, no obligation trial that includes the main application and a quiz creator. The download will be available once you have registered at the website. The purchase price for the package is $97 for a one-year license, which can be purchased via PayPal. There is also a "Pro" license, which has yet to be officially priced by the PEM staff. This service, when released, will give customers access to exclusive content, a personal mentor, and professional feedback. PokerEduManager is also seeking coaches who would like to make money through their passion for poker. Use the Pro Advice infrastructure to create your own poker training program and start earning through PEM. Whether you enjoy giving advice to fellow players or are in the habit of creating summaries and quizzes from available content, PokerEduManager Pro Advice can be your ticket to your own personal poker training program. To find out more, send an e-mail to proadvice@pokeredumanager.com. To learn more, potential customers can visit PokerEduManager.com, where they can subscribe to PEM's notification list and receive an exclusive launch discount as well as a free copy of the e-book "Poker Training, the Smart Way." @Mike's Comment It was obviously too complicated for you to give any reasons. 5olha que interessante Covish e Passad0 dirasesm que eu tomava uma surra no sharkscope.com e no officialpokerrankings.comentrei agora a pouco por curiosidade, comparei nossos resultados no sharkscopeplayer name games played AVG ROI total profit abillity/100 covish 3.206 -4% $-840 57 Luiz_DarkOz 767 40% $6,668 77 Passad0 9.595 0% $-319 59e9 mais bonito ainda quando se compara os gre1ficos, recomendo a todos uhauahuacadea os caras agora?Luiz_DarkOz Reply:janeiro 7th, 2011 at 16:40covish 3.206 jogos / -4% de ROI / $-840 de lucro / Hab. * 57Luiz_DarkOz 767 jogos / 40% de ROI / $6,668 de lucro / Hab. * 77Passad0 9.595 jogos / 0% de ROI / $-319 de lucro / Hab. * 59melhorou *Hab = HabilidadeLuiz_DarkOz Reply:janeiro 7th, 2011 at 16:41que bosta sempre fica zuado Reply:janeiro 7th, 2011 at 16:57Acertamos para vocea Passad0 Reply:janeiro 7th, 2011 at 19:20Estarei guardando meus bons resultados para a sequeancia do ano meu garoto. Ainda assim, sou mais pro que vocea, seu feio! aehuahuehauehaea Se fica provocando que nf3is vai cravar os fode3o de domingo ai se vai ver o nabo rapa. Sunday million e 750k GTD que nos aguardem. Finalmente, je1 tava na hora de tu comee7ar a ganhar algumas coisas te1mbem ne9 aheuhaeuheaueha O ano sf3 este1 comee7ando campee3o, vou deixar meus showdowns para mais tarde me aguarde (6)Passad0 Reply:janeiro 7th, 2011 at 19:21Comentario ne3o te1 funfando?Passad0 Reply:janeiro 7th, 2011 at 19:22Aguarde-me campee3o, aguarde-me Ate o final do ano tem muito tempo, vocea te1 na frente agora, mais ne3o siguinifica que sere1 assim para sempre viu Me aguade seu Donk, me aguarde Luiz_DarkOz Reply:janeiro 7th, 2011 at 19:34ente3o digamos que ATUALMENTE eu sou melhor que vc, que se compararmos nossos resultados o DONK e9 vc, que ente3o meus resultados ne3o se3o por sorte ou seja le1 o que for e com certeza 1 ano vai ser pouco pra vc me alcane7ar sf3 se vc parar de jogar seus micros sit's e comee7ar a jogar torneios de verdadePassad0 Reply:janeiro 8th, 2011 at 00:48ahuehueahueaheau Que os jogos comecem ente3o ;DCovish Reply:janeiro 8th, 2011 at 16:50Engrae7ado, antes de vocea cravar 2 mtt, quem era vocea?Vocea ganhou qts nesses 2 torneios? Agora pega o quanto vc tem ali encima e diminui os 2 prize Vamos ver: $6,668 $7511= -843 .Meu profit ta -25 . Pore9m eu tenho quase 2600 jogos E vocea? sf3 700 ne9?Hmmmm Tem algo errado ai sem +!! !Luiz_DarkOz Reply:janeiro 9th, 2011 at 01:42vc e9 meio doidinho de onde tirou esses numeros?e antes de cravar meus mtts aqui na UP sempre fiquei na sua frente ente3o fica na moral e vai melhorar seu joguinho em vez de ficar falando faz igual eu mostra RESULTADO!! !Covish Reply:janeiro 10th, 2011 at 19:12Ate9 onde sei, meus resultados na up este3o bem a frente de vocea Tirando 1 cravada sua que vocea deu pra ganhar o xbox e a mesa final onde conseguir entrar no sng de ranking vocea ne3o teve mais nada Preciso mesmo melhorar meu jogo!! Ta puxado viu E eu ne3o tenho jogado mtt amigo, ne3o sou rico e nem tenho muito $$ igual vocea pra ficar jogando mtt sempre que desejar Esse ano to com 1 projeto pra ser grinder de sng BTW, ta na hora de parar com essas briguinhas ne3o acha? Se vocea tem cravado alguns torneios e tem jogado bem Beleza Parabe9ns O resto a gente resolve nas mesas =)Covish Reply:janeiro 10th, 2011 at 19:13E tirei meus os nfameros no site mais respeitavel sobre poker Sharkscope.com vocea deveria conhecer-lo. Go to a bike shop and ask them what size you need, and try a new bike of the right size out in the parking lot. I would guess 56 or 58 cm road bike. You don't have to buy that bike, you are just lonoikg. Check lots of bike shops, try out one from each store. All good bikes have 700c (road or single speed road) or 26 (mountain bikes) tires. Be sure to get a bike with a strong rear wheel, as you probably will hit lots of potholes. I got a nice 20 speed bike with quality components, but found they skimped on the spokes (32 spokes of .072 dia.straight gage of poor quality). So after months of broken spokes, they rebuilt the wheel with .080 dia. DT Swiss brand spokes.